Manage your safety, security, quality, and OHSE issues with the OmniSMS v4 web application. Integrating these management systems brings added value and efficiency to your SMS, regardless of the size of your flight department. Which Standard is Right for You? For many corporate flight departments, IS-BAO is the standard of choice. OmniSMS meets and exceeds these requirements with an iPad and mobile-friendly application that delivers web-based hazard/occurrence reporting, policy, documents, flightrisk and maintenance assessments, audit checklists, and SMS eLearning courses. Provide simple hazard reporting or enable mandatory occurrence reports (MORs), configured precisely for the MOR events your regulators specify. 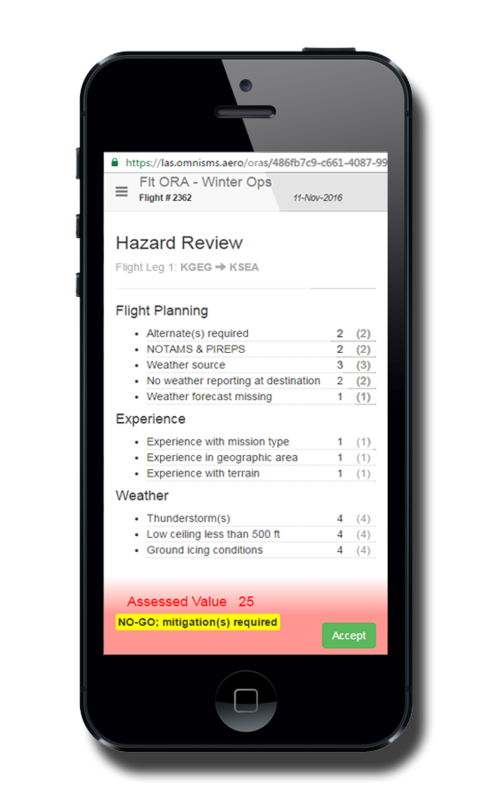 When reports are received, auto-email notifications alert your flight department manager(s) via their mobile phone with a quick-link to the submitted report. Occurrence reports also automatically update key safety performance indicators, and alert management if a threshold has been exceeded. Discerning OmniSMS clients have chosen a higher path; one that not only meets all IS-BAO / ICAO standards, but also the requirements of FAR Part 5, Advisory Circular AC 120-92B, and FAA’s SMS Voluntary Program. FAA breaks down SMS components and elements into processes. OmniSMS addresses these processes with clearly written procedures and an intuitive web interface. Guidance is also built right in to the OmniSMS application, so admins and users understand what they need to do, how to do it, and why it’s being done. Above all, OmniSMS makes actual day-to-day safety risk management and safety assurance processes easy and effective. Key performance indicators (safety, quality, and OHSE) can be configured based on your choice of hours worked, hours flown, or segments flown. Enlist the same professionally developed quality management tools we’ve created to manage safety risk, for quality management and the management of other important processes. This brings much added value to your SMS investment.